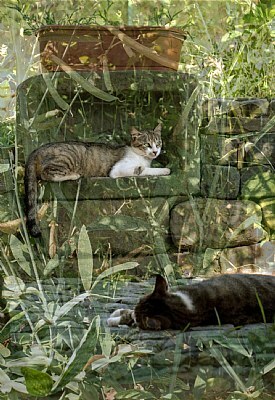 About two shots layered of two of our cats,. tempratures rising,. enjoy,.,. also they see things we cannot,. thank you dear srna,. my best regards art,. thank you dear roby for looking back and much appreciated comment,. best regards art,. keep well,. thank you very much nigel,. appreciate,. regards art,. thank you bruce for very kind comment,. tis appreciated for sure,. best regards art,.,. have a great weekend and beyond,. many thanks salvador,. as always appreciate your time to comment kind words,. best regards art,. have a great weekend and beyond,. Congratulations for the image and the well deserved award. many thank you,s to IO staff,. fully appreciate your tasks at hand,. my best regards to you all,. have a great weekend and beyond,. art,. thank you jose,. much appreciated, and as always my best regards, art,. have been there many times riny, its always hard and still we love them,. thank you for looking in and appreciate your comment,. best regards art,. Very pleased you received SC award for this image. i always translate your comments marcos,. thank you so much,. best regards art,. enjoy the weekend and beyond,. thank you ayan,. much appreciated,. just trying to make a pet photo a little more interesting,. best regards art,. enjoy the w/end and beyond,. indeed tranquil and so peaceful jill,. i love the way they move to a cooler stone now and then,. thanks jill,. much much art,. thank you jose much appreciated,. glad to spark a memory and imagination,. glad you like,. best regards art,. enjoy w/end and beyond my friend,. Its too good art, excellent job. Love the way one is on look out while the other sleeps. Great capture of a tranquil moment. Title, subject, work and end result are excellent Art. Very moody image not only because of cats. Remembers earlier works with slides on double exposure. Like it, wish a nice weekend.